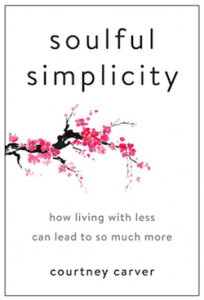 Soulful Simplicity isn’t a book entirely about uncluttering and minimalism. 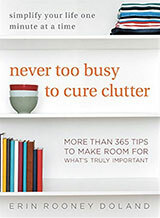 It is a book about the author’s journey to her ideal life (of which uncluttering and minimalism play a large part). A number of years ago, Courtney Carver was diagnosed with Multiple Sclerosis (MS). She recognized that her lifestyle was exacerbating her symptoms. She needed to reduce high stress levels caused by clutter, debt, overwork, and trying to meet the needs of everyone in the family. During the first few chapters, Carver she describes her life after her MS diagnosis. She felt that MS was her wake-up call then she goes on to say, “…but had I been really paying attention I would’ve woken up sooner.” Carver explains that the way she was living was difficult but at least it was familiar. Isn’t that the case with so many of us? We cling to our old habits because they are comfortable and we resist change because it makes us feel uneasy. 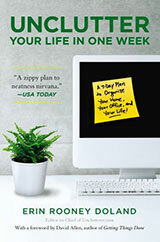 By following Carver’s journey in Soulful Simplicity readers can learn how to create their own ideal lives. Carver came up with the “Simplicity Summit” — a type of family meeting to discuss, in a supportive environment, why you are simplifying your lives in the first place. Her book provides a guideline on how to hold your own Simplicity Summit. There are lists of questions to ask each other and suggested action steps to achieve your goals. One idea I liked was Carver’s suggestion to change your lifestyle slowly by using habit stacking — establishing one habit at a time then adding a new one so that each habit triggers and supports the others. For example, if you want to increase your daily water intake, drink a glass of water before every meal. You are already consuming a meal so that habit is already established, adding another habit onto it, will help create a pattern that will stick. Carver doesn’t really delve into the organizing process itself (for example, where to donate shoes or what is the best spot for the coffee maker), but she does discuss a lot of causes and reasons for clutter accumulation. From debunking the myths of ownership to shopping away the pain to dealing with the guilt of letting go, she helps readers wade through the emotional turmoil and come out on the other side with a better idea of the life they want going forwards. If your New Year’s resolution is to move towards a lifestyle with less stress and less stuff but more joy and more soul, I highly recommend Soulful Simplicity.